So yesterday I answered the first question out of the following list. 12. The evolution of your kitsuke. Eeeek that is a good question. Obviously my first kimono is the most important kimono in my collection as it was the one that started the whole obsession. It was not flashy and as it was a komon, I could wear it everyday if I wanted. However it is silk so I would be a fool to try and wear this day after day. There is another kimono which always come to my head when I think about kitsuke and it is this furisode. Again it is another non-flashy kimono and I remember looking at this furisode on ebay thinking that this is a bit plain for a furisode? Why? Anyway I like the simple silver crane design and just had to have it. My impression is that this furisode was made for an unmarried girl who was a little older then average hence the lack of colour and embroidery. However this suited me perfectly as I am in my late twenties and technically getting a little bit too old to wear furisode. I do own another furisode which is more typical of the kind worn my girls at the coming-of-age ceremony but that is for special occasions where a little bit of show is needed. First attempt on Red Velvet Cake. Photos from the BUNTweetup Yorkshire. 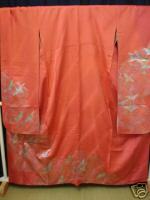 Kimono demo and workshop at Alcon!